You really can have it all in one. The SCX-6322DN is so easy to use that they will surprise you. Print, scan, fax, and copy without leaving your office plus the benefit of lower maintenance compared to an A3 copier. With the fastest print/copy speed in its class along with duplex and built-in network capabilities you’ll wonder how you every managed to get anything done without it. With SAMSUNG it's not that hard to imagine. According to the report, we are using 2.35% * of total volume is on A3 paper recently which is less than a page a day. Because people move more to scanning and printing original documents, which can be scaled to fit the paper size available, the requirement for A3 output has declined because of good software such as Microsoft Office, Acrobat Reader and some kinds of Internet Browser. SAMSUNG SCX-6322DN is doesn't need centric space of office as A3 copier, just the corner seat of your desk will be required. You will be happy about lower initial cost for cutting off premium for sales of A3 copier and 40% saving maintenance cost as well. *Source: UK Research Study 2006 "New field IT Report". The standard 550-sheet paper tray, 100-sheet multi purpose tray and optional 550-sheet additional tray are able to print up to 1,200 sheets. It will be much help to make less reloading and save your time and efforts. Just push the one-touch button to reduce toner consumption up to 30% while still getting high quality printouts in a slightly lighter tone. With the scan to SMB (Server Message Block) feature, user can store scanned documents directly to a shared folder in user’s PC. Max 20 destinations as shared folder and encrypted password are available. It is an efficient way to digitize and transmit large quantities of documents. Simply scan hardcopy documents, convert them to digital format, and store in a specified directory on the in-house or external FTP server. It is a very effective scan solution for transferring large size documents due to its dedicated functionality. SAMSUNG’s advanced scan to network solution gives you an easy way to capture and store information from hardcopy documents. Featuring the same walk-up simplicity of our other scanning solutions, scan to network turns your SAMSUNG network connected MFP into a powerful engine for capturing and sharing information. Now you can scan directly to your document management system. It will be right for any office department such as goods in, sales, finance, marketing, technical support and others. It creates professional duplex (2-sided) documents in 4 copy formats including 1:1, 1:2, 2:1, 2:2 with simple one-touch buttons, saving on paper or additional equipment costs. The intuitively designed operation panel has ergonomic one-touch buttons such as frequently using features - collate, reduce/enlarge, lighten/darken and a clear LCD display and an Error Indicator for instant job status checking and more direct control. Allow you to maximise the use of the 20,000 pages yield drum unit by replacing the 8,000 pages yield toner cartridge separately, thereby extending the drum’s usability. SAMSUNG’s powerful scan to e-mail solution lets you e-mail documents to anyone in the world directly from your network connected multi function printers. Delivering enhanced functionality, SycnThru™ web admin service is SAMSUNG’s web-based printer management application, delivered as a browser plug-in. SycnThru™ web admin service gives any indows PC on the LAN instant access to all networked SAMSUNG printers and MFPs. SycnThru™ web admin service gives you the ability to perform firmware upgrades, monitor printer status configure settings and receive alerts when faults occur. SycnThru™ web admin service also offers group management facilities enabling batch firmware upgrades and group error reporting. It’s secure, too. Only authorised users are able to change printer settings while all the others have the benefit of being able to check a printer’s status before sending a job to be printed. SAMSUNG’s SmarThru™ Office is a powerful document management application for Office users. It creates, stores and edits scan images, and delivers them to each application. 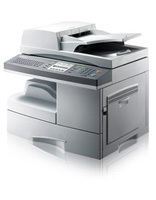 In addition to the previous SmarThru™ functions, document management and editing features are greatly enhanced for easy and convenient use with SAMSUNG MFP in offices with complicated networks and a variety of equipment and network scan is provided as default so that users do not have to install additional applications.